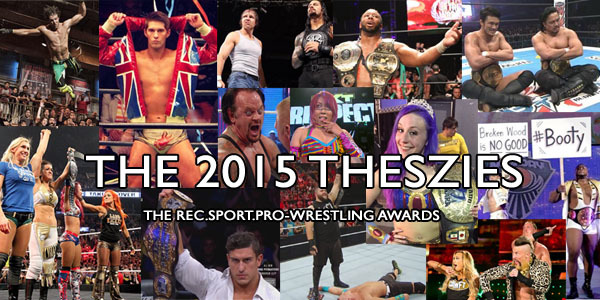 Welcome to the results of the 2015 Theszies / Rec.sport.pro-wrestling Awards. This year we had 753 voters participating – less than last year, but that was largely because last year we had a large flood of voters from With Spandex and this year WS felt that they didn’t want to campaign overly for the Awards so they limited their linkage to one post. Which meant less voters from them – but more voters coming in from other sites. As always, for next year we encourage all of you wrestling media people to nominate yourselves and your favorites, and try to get your fans out to vote for you. Fair is fair! As always, thank yous to Justin Henry, Christopher Robin Zimmerman, Herb Kunze and all those who have previously run the Awards and contributed to their legacy; everybody who chipped in to promote the awards; all of you voters, of course; and finally and most importantly an extra-double-sized thanks to mgkdotcom’s Tech Guy, James Young, without whose invaluable assistance these Awards would almost certainly have failed to be anywhere near as successful and user-friendly as they in fact were. The “Best” Awards can be found here. The “Worst” Awards can be found here. And finally, full ballot counts for all Awards can be found here. Thanks for playing, and we’ll see you next year! Minor complaint: In Most Improved Wrestler, AULAYAN is credited with a comment that was from me.